Our 32 Tips posts give you great advice on some of the most expensive destinations in the world. Check out all our 32 Tips posts here. 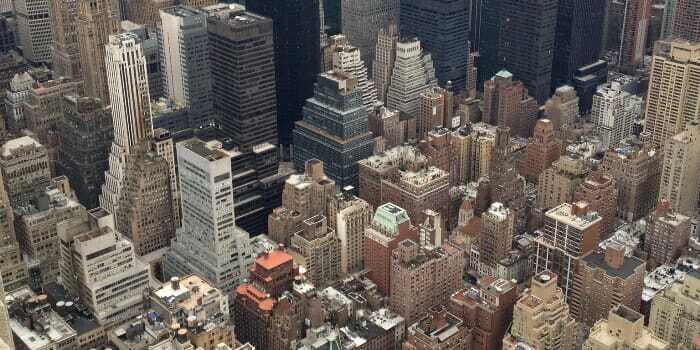 Credit for this great view of Manhattan goes to reader Sandra who is from the UK. Can you travel solo to New York City and do it on a tight budget? While New York City can be expensive, there are plenty of affordable things to do and see. I'm just back from yet another trip to the Big Apple. I never get tired of this city and I never stop finding new places to eat, visit and explore. But compared to most people, I do New York on a shoestring. So, I have more advice for you. I'm expanding this post yet again with seven new tips for solo travelers in New York. Watch for NEW, in the list below and you'll find them. As always, my tips are designed to help you save money. So that the Big Apple doesn't take a big bite out of your wallet, here's my take on the best of budget New York City for solo travelers. 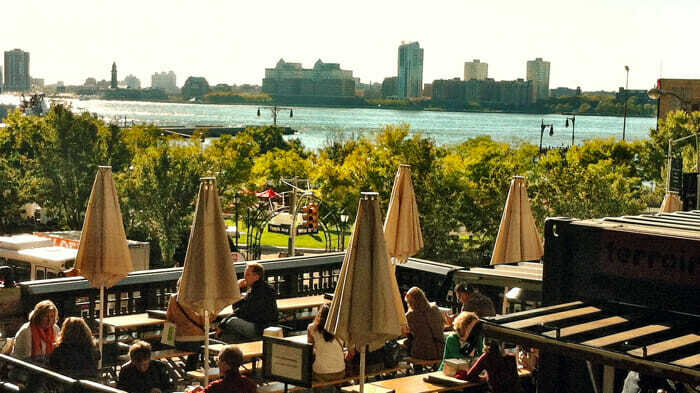 On the High Line, an elevated park, there are cafes and small restaurants for lunch or a snack. Balancing safety with your budget is important when you travel solo. The New York transit system works well and is generally very safe. Yellow cabs are expensive but safe. Uber and Lyft are a somewhat less expensive option to cabs and have their safety system built in through the rating process. I don't recommend ever getting into an unmarked cab though I have often been offered one in New York. From the airport to the city. This article gives you information on traveling from all NYC airports via public transit. In some cases the GO Airlink Shuttle is a better deal in terms of time and money. NEW - Uber from the airport. I normally take the train from Newark Airport to Penn Station and then hop on NY Transit to my destination. But my plane was delayed on this occasion and I had meetings at the New York Times Travel Show so I first checked on the cost of a taxi (US$55 + tolls) and then called an Uber which cost US$51 all in. It took me to midtown where I was staying at the St. Giles Tuscany Hotel. They have an entire section of their site called Go Solo Go St. Giles. They sponsored my accommodation in the city. Get a MetroCard. The bus and subway system in New York City is a really efficient way to get around. You can buy a single ride at station kiosks for $3. 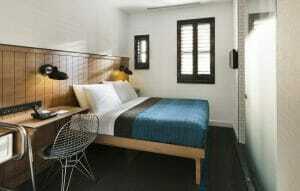 However, you'll likely want to check out the Metrocard options for your stay. Take the people's ferry. The Staten Island Ferry is free and offers such a great view of the city. It runs 24 hours a day, 7 days a week, with more frequent service during rush hour on weekdays. You can get free WiFi on the ferry and in the ferry terminals. Here's a post that gives you great information on a Staten Island tour. Take a bus tour. A Hop On, Hop Off tour is great if you're short on time or want to get an overview of the city before you dig into its specifics. If I only have a couple of days in a city I generally take one. Washington Square and Greenwich Village - Solo Travel New York City: Recommended Tours includes a tour of the Village. Time Square - It's a spectacle but you don't need to spend much time there. 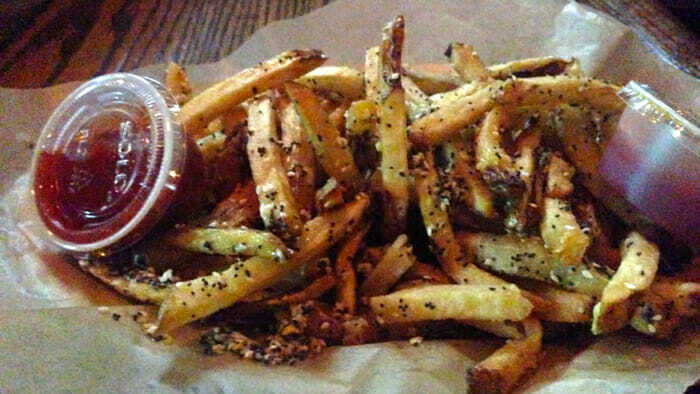 These are bagel’ fries - crispy, so hot, so good. Read Grace’s Nerdy New York City Adventure: a twenty-something travels solo. Delicious Pad Thai at By Chloe vegan restaurant in the Village. NEW - Blooms Deli. Located around the corner from the St. Giles Tuscany Hotel, Blooms is a New York Classic. It's been around since the 1930's. They have a separate gluten-free menu. I found gluten-free options just about everywhere I ate and though I'm not gluten free I thought I should mention it. A deli is so casual it's comfortable for solo travelers. NEW - Go to Arturos's for a Slice and some Jazz. A New York City institution in the West Village, they've had a wood-burning oven and nightly jazz since forever. They also offer a wide choice of Italian food and gluten-free options. I had the arugula salad with shaved parmesan and a 13" pizza that I could only eat 1/3 of. The service is great. Eating at the bar, which is really social, is an option here. NEW - By Chloe vegan restaurant. Located on Bleecker Street in the village and four other New York locations is By Chloe. Their bakery is next door. Healthy and yummy! They also take good care of gluten-free patrons. A casual atmosphere and a large communal table make By Chloe great for solo travelers. Eat at a Food Truck. Food trucks can be a big part of a budget New York City experience but... where to find them? Food trucks are always on the move. Here's a site that will tell you where and when the most popular food trucks are in NYC. Free pizza. The Alligator Lounge offers free pizza every day of the week along with karaoke, trivia, comedy... whatever's going the night you're there. Your local guide. 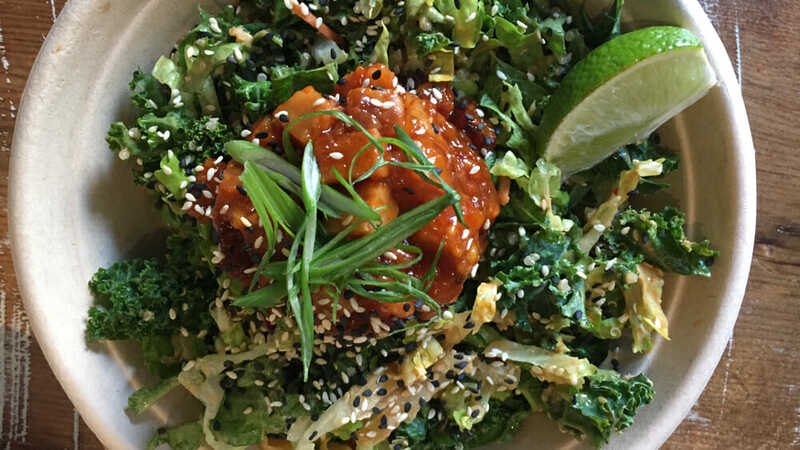 Check out TimeOut New York's cheap eats guide for their latest recommendations. Meet Tony. You may be lucky and get him through the Big Apple Greeter program. Read about my tour here. Big Apple Greeters. Whatever your interests, with luck, you'll get a volunteer tour guide who shares them and will show you their beloved New York. New York By Foot. Free tours but it's important to tip - I think $5 is the minimum. Explore the Village. Take one of 28 self-guided tours offered by the Village Alliance. I sure wish they had these as an app, but perhaps that is coming. Tour Grand Central Station. Every Friday at 12:30 pm, the Grand Central Partnership conducts a 90-minute guided walking tour led by an urban historian. New York City Pass. There are various options (with and without bus tour) and they often run specials so have a look and see if the New York City Pass will save you money on what you want to do in New York. Museums. Watch for free times for visiting the many museums in the city. The Museum of Modern Art offers free admission from 4:00-8:00 pm on Fridays. Museum at the Fashion Institute is always free. For a complete list of New York museums and when they're free go to FreeMuseumDays. Go to Cathedral of Saint John the Divine. Located on the upper west side, Saint John the Divine is a massive cathedral and a major attraction in the city. It's free, though donations are appreciated. And, bonus, down the block is the diner featured in the Seinfeld series. Go shopping and get a deal. Here's a guide to shopping deals in New York City. You can also check out Time Out's sample sale page. It's updated all the time so sometimes the list is long and at other times it's shorter. NEW - TodayTix. This is a new app for getting discount tickets in New York City, London, Toronto and other major cities. I tested it on tickets to see John Lithgow's show called Stories by Heart. The seat I got sells for $109 online. On TodayTix I chose the lottery option. If I had won I would have got my ticket for $25. I received an email that said I didn't win but I could buy a ticket for $30, which I did! Before buying I looked at reviews of the service to make sure they were legitimate and I turned on my VPN as I was going to use my credit card on public WiFi. (VPN for Travel: What, Why and an Easy Setup Guide) I picked up my ticket from a TodayTix customer service person outside the theatre. Upright Citizens Brigade Theater. This is a great deal. Founded by Amy Poehler and others, UCBT offers improv theater. At $10 it's a bargain but sells out quickly so book in advance. Buy discount Broadway tickets. Shows on Broadway are expensive but, if you're willing to stand in line, you can buy tickets for 20%-50% off on the day of the show. There are a couple of places you can do this but go to the TKTS Discount Booths (their flagship location is in Times Square) and you'll be supporting the non-profit Theatre Development Fund. Off-Broadway productions. Off-Broadway is cheaper than on, so check out The New York Theatre Guide to Off-Broadway shows. Dance parties in Brooklyn. There are free concerts/dance parties in Brooklyn Bridge Park throughout the summer. Shakespeare in the Park. This runs from May to August (check specific dates). Tickets are handed out free in the park and around the city. Danielle - A few more tips, as I live here, and work on Broadway: if you can't get to a TKTS booth, download the TodayTix app if you're interested in Broadway/Off-Broadway tickets at a discount. And if you're a student or trying to do it on the cheap: a lot of shows have "rush" tickets when the box office opens, or a lottery 2 1/2 hours before the show. Also for free/cheap stuff to do: the skint. It's the absolute best. Karla - I second the recommendations about cheap theater tickets. I tried the lottery for the first time last spring, when visiting with my son, and we got 5th row tickets to Newsies on Broadway for $27 each! I also use playbill.com to get discounted tickets in advance. 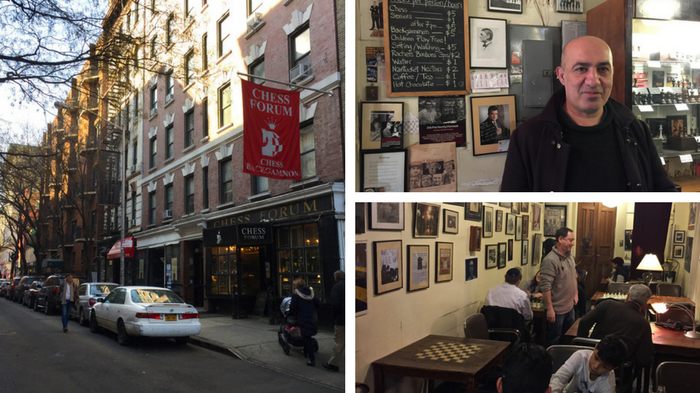 The Chess Forum is just south of Washington Square at 219 Thompson Street. The Pomegranate Gallery is on Greene Street where you'll also find Versace, Chanel, Hugo Boss and other exclusive stores. NEW - Go to the Chess Forum. Chess lovers must go to The Chess Forum. If you want to learn chess you must go. If you want to see a Greenwich Village institution, go. The Chess Forum is "located at the original site of Grandmaster Nicolas Rossolimo's Chess Studio. Bobby Fischer was a frequent visitor to the studio and so were art and film greats Marcel Duchamp and Stanley Kubrick. NEW - Go to local art galleries. On the recommendation of Imid from The Chess Forum, I went to the Pomegranate Gallery where I had the great fortune of meeting Oded Halahmy, the artist and gallery owner. 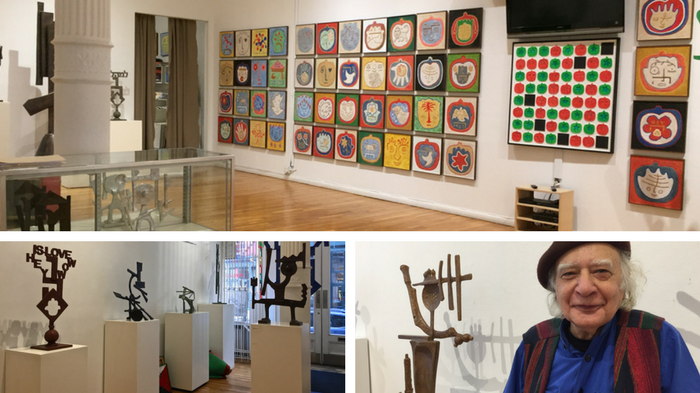 "Oded Halahmy was born in Iraq, moved with his family to Israel in the 1950s, was educated at St. Martin's School of Art in London, taught sculpture, and is in the collection of the Guggenheim Museum, the Hirshhorn Museum, and the Israel Museum in Jerusalem, as well as many other public and private collections worldwide." Join a local running group. The North Brooklyn Runners is just one of the groups you can join for a run and a coffee afterwards. Here's a list of running groups by district. A calendar of free events. You can see what's free at NYCgo.com. Check out Meetup.com. There are groups for people interested in hiking, architecture, technology, wine... there are groups on every subject imaginable. 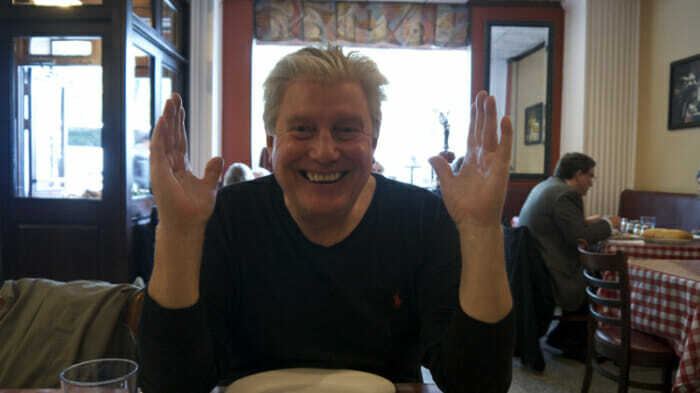 Find a Meetup in New York City and go to meet locals who have similar interests as you. Go to an Open Mic. In a city with as much talent as New York you know that the Open Mic scene has to be a good one. And where there's an Open Mic there are always friends (locals) out to support the artists. Here's a list of the best Open Mics in the city. Go kayaking on the Hudson. What a city! The Downtown Boat House promotes public access to the waterfront for all and offers free kayaking. Don't know how to kayak? Take one of their free classes. The drama of chess. Go to the southwest corner of Washington Square and watch the drama as people try to beat the regulars. Or test your own skills at $5 a game. Take a beer tour and tasting. Brooklyn Brewery hosts tours and tastings every day of the week. Check for details. Bookstores worth browsing. Spoonbill & Sugartown, Berl's Brooklyn Poetry Shop, Housing Works Bookstore Cafe. Here's the Gothamist's list of the 10 Best Bookstores In NYC. Visit the local chapter of your favorite organization. Are you a member of a service group or association? If so, plan to go to a local chapter meeting and see the city through a local's eyes. 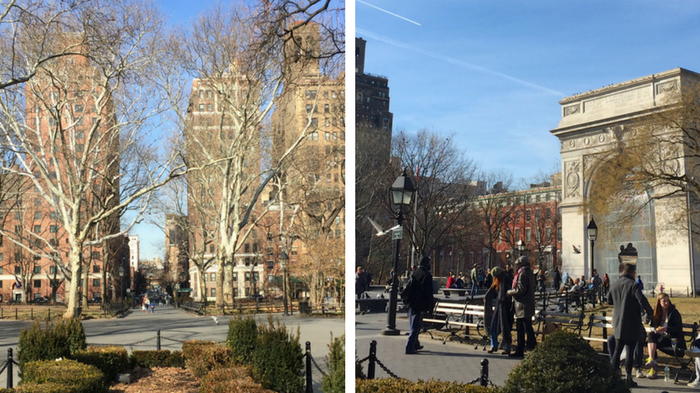 Two views of Washington Square. Go to the southwest corner if you want a game of chess. Intelligence Squared US (IQ2) debate. $12 for students. $40 for adults. New York Philharmonic Rush Tickets. Rush tickets are only available for students and seniors. 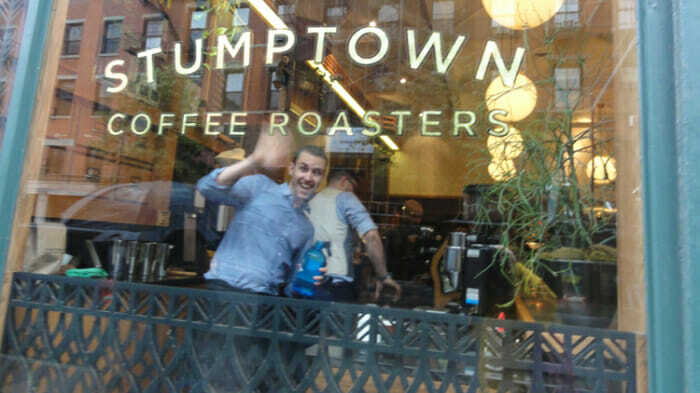 Stumptown Coffee - New York is a friendly city. Booking.com is the #1 choice of hotel booking sites according to our 2017 Reader Survey. If you click on one of the links below and book we will receive a small commission. You'll pay no more but you will support Solo Traveler. This small studio in a great Manhattan location is just $100/night when I checked. Here's a link to their Manhattan listings. Naturally, they have more in the Burroughs. I find great deals on VRBO.com all the time. 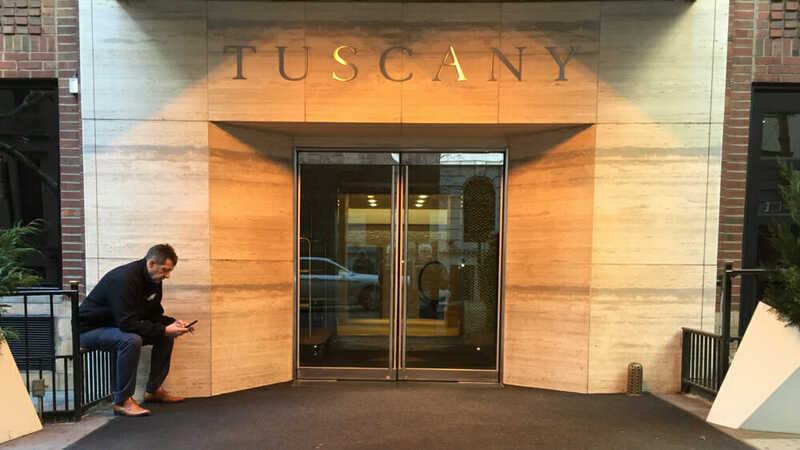 Located in midtown Manhattan, the St. Giles Tuscany Hotel has a Go Solo Go. St Giles program.